Saturday night was our work Christmas Party. Now I agreed to change my schedule before I knew the dates of the party - but other people decided they did not need to work this other weekend - so I partly felt screwed. But it has worked out wonderfully so that we can make our yearly SF trip during the week when things will be calmer - wetter, but calmer. I dont know if this event center had never handled such a large crowd before or what. But not only did the food stink, but service was soooooooo poor. We walked in to large tables of 12 and I dont know how many there were - we were smack dab in the center at #25. All the tables were set with shrimp cocktail - obviously frozen shrimp with a mere smear of bland cocktail sauce. After about 1/2 hour - 45 minutes those were partially cleared away. The serve took the glass that held the shrimp - when they served the salads you were left holding the plate the cocktail had been on until they finished serving the salads and came back to take the plates - and even so they forgot to serve one of the people at the table! The salads were nice. And then after another 45 minutes or so, came the entrees. Watery mashed potatoes, with 6 brussel sprouts on top of the potatoes (as a definite non brussel sprout lover, this was definitely a no no! ), the meat sauce was on the plate on the opposite side from the meat - and partially on top of the mash potatoes....the tiny tiny thigh/drumstick of the chicken plate was very good. The steak was raw. I like my steak rare - well medium rare. This was seared on the outside and raw on the inside. Several people complained and they took the steaks back to cook a little more....instead they brought them another entire plate with....you guessed it!....another piece of raw steak!!! As long as it took to serve this meal, there should have been time to cook the steak! I didnt have lunch that day in anticipation of this meal, so I did gag it down (literally, the last piece, I almost had to spit out). There were 2 bottles of wine on the table for 12 people, with notes telling how to purchase more wine. The chardonney was ok - altho that day when we went to a few wineries on their Holiday Trails (www.lvwine.org/event/68/1259989200_126007) I tasted much better wine. We did empty that bottle but the cab was not finished. 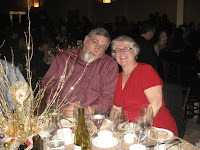 I am so mad at hubby - I would have loved to have a nice photo of us but look at his face - coupled with the line of "drool" coming out of his mouth! 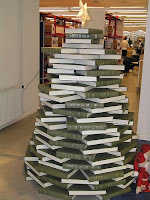 Well, I love the library Christmas tree. It is too bad about the event. I think often organizations will hire in the extra help during the holidays and they just aren't well trained. I know that when my sister used to work in restaurants, she would always be putting out pleas for help during the holidays (and "wedding season"). I hope someone let the administration know about the problems.